PALMDALE – The Palmdale Amphitheater (The Amp) is celebrating its ninth season with a fall lineup of concerts and events for the entire community. Dating back to August 2007, GraceFest has become the Antelope Valley’s Premier Music and Message festival. GraceFest returns to the Palmdale Amphitheater on Friday and Saturday Sept. 20 and 21, for two nights of music and fellowship. Headlining GraceFest 2013 are Jars of Clay, Kutless and Colton Dixon. Tickets and information are available at www.gracefestav.com. Call 661-722-6112 for more information. G-Com Services is hosting the inaugural G-Com Benefit Concert in support of the Wounded Warrior Project, on Saturday, Oct. 5. Gates open at 11 a.m., with opening ceremonies at noon. Musical acts include Vagrant X (Classic Rock Band), Runaway (country) and Joel Hatcher Band (Rhythm and Blues). Tickets are $10 general admission. The event is free for children under 12 with accompanying adult, veterans and active military free with military ID. Bring a blanket or lawn chair. Food will be available on site. For tickets and information, visit www.gcombenefitconcert.com or email gcomservices@outlook.com. Join walkers from across Antelope Valley as they step out to have fun, get inspired, and support a meaningful cause on Sat. Oct. 12. Registration and expo begin at 7 a.m. at the recreation center off of 30th St. West. The walk begins at 8:15 a.m. There will be a 5K and 1 Mile Survivor route. Following the walk, there will be fun activities for kids at a Kids Zone. There will also be free CPR demonstrations and blood pressure screenings. To register, visit www.antelopevalleyheartwalk.org. 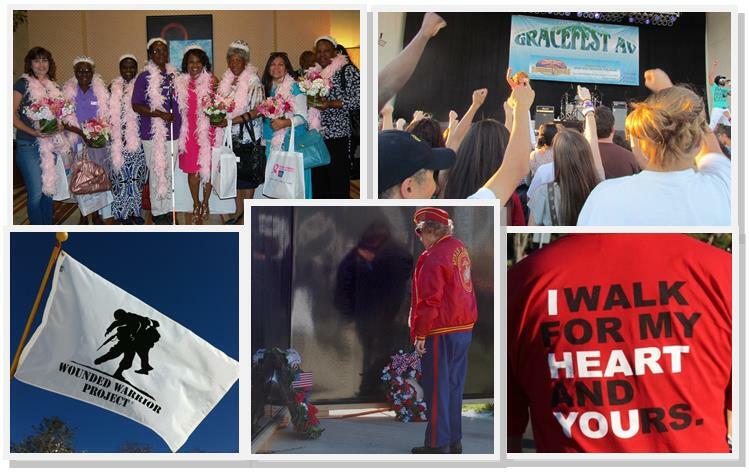 For information, contact the Antelope Valley Heart Walk Team at 213-291-7094 or email la.heartwalk@heart.org. In celebration of National Breast Cancer Awareness Month, the American Cancer Society invites the Antelope Valley community to its inaugural Making Strides Against Breast Cancer 5K noncompetitive walk, scheduled for Saturday, October 19, at the Palmdale Amphitheatre/Marie Kerr Park, 2723 W. Rancho Vista Blvd. Registration begins at 7 a.m., and the walk starts at 8 a.m. (Read more here). To learn more about the American Cancer Society or to form a team for the event, call 800-227-2345 or visit makingstridesantelopevalley@cancer.org You may also contact Ima Moore at emooreno4@msn.com. Point Man Antelope Valley and the City of Palmdale will present the Mobile Vietnam Veterans Memorial Wall for the Antelope Valley (AV Wall), on display from Thursday, Nov. 7 through Tuesday, Nov. 12 at the Palmdale Amphitheater. The public will have 24-hour-a-day access to the AV Wall, while it is on display, and a series of events surrounding the display at the Palmdale Amphitheater. The events will include both opening and closing ceremonies, a special event to observe Veterans Day, and the Antelope Valley Service Organization Association’s (AVSOA) annual Veterans Day Ceremony on Nov. 11 which will be held in front of the AV Wall. The AV Wall is one of only two mobile walls that are engraved, and the only one laid out in the same design as the original in Washington, D.C. Measuring approximately 250 feet long and 6 feet high at its apex, it contains the engraved names of all 58,272 Vietnam veterans killed in action and missing in action. For more information on the AV Wall, call 661-524-6408 or visit www.avwall.org. To learn more about events at The Amp, visit www.cityofpalmdale.org/amp, or call at 661-267-5611.